Until a few weeks ago, I thought corn was the only grain in the grits game. 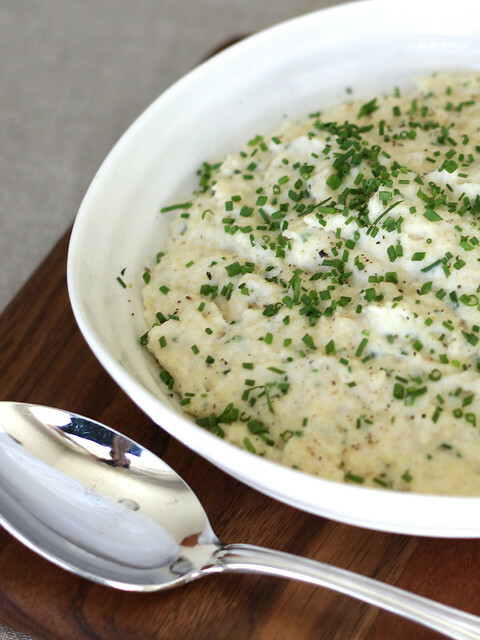 Turns out, millet grits are a thing — and a mighty tasty-yet-more-neutrally-flavored one at that, making them the perfect canvas for the addition of goat cheese and chives. They are a great option for those with corn allergies, or if you’re simply looking to add a little bit more whole-grain variety to your diet. Try this side in place of (or in addition to) mashed potatoes alongside a pork tenderloin, roasted chicken or even your Thanksgiving turkey. What’s great about this recipe is that any leftovers — or the whole batch — can be transformed into practically an entirely different dish. Simply transfer the warm or hot grits to a heatproof, small dish or loaf pan coated lightly with olive oil. After chilling in the fridge for at least a few hours, the block-o-grits can be popped out, cut into slices and fried (preferably in a bit of butter in a nonstick skillet). They become slightly crisp on the outside and creamy in the middle, and are fantastic served as part of a hearty breakfast alongside a fried egg and some bacon or sausage! If you can’t get ahold of the millet grits — or want to switch up the flavor a bit — feel free to substitute 1 cup (140 grams) of gluten-free corn grits/polenta — all other measurements stay the same. In a medium pot (4-quart) over high heat, bring water to a boil. Whisk in millet grits, salt and pepper. Cover pot, reduce heat to low and simmer grits for about 10 minutes or until grits are softened (they’ll still have a slight crunch) and nearly all the water has been absorbed (stir about half way through). Remove pot from heat and crumble in goat cheese; stir until evenly distributed and creamy. Stir in about 3 tablespoons of the chives and the half and half, just until mixed. Season to taste with additional salt and pepper. Transfer to a serving bowl and sprinkle remaining chives on top. Serve immediately!